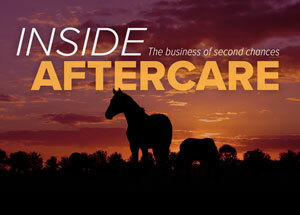 In the last few years Thoroughbred aftercare has evolved from a small handful of charities helping horses in need to a booming movement with its own large events, market for horses, and even off-track superstars. But those inside the aftercare industry say there is still a lot of work to be done. In 2011 the Retired Racehorse Project published their "Expanding the Market for Ex-Racehorses" report that contained United States Equestrian Federation statistics for breeds of registered horses (owners register horses with USEF when they compete in sanctioned horse shows). In 1982 Thoroughbreds made up 40% of USEF registered-horses. By 2010 that number declined to approximately 10%, and as of January 2017, the Thoroughbred isn't even listed under the "Breeds & Disciplines" section of USEF's recently redesigned web site. Of course, competition horses aren't the only Thoroughbreds with second careers, and not all Thoroughbred sport horses are former racehorses. But since USEF oversees equestrian competitions across the U.S., its members and their horses are a good indicator of the country's equestrian community and its shift away from using Thoroughbreds in competition. The report goes on to list some of the possible reasons why: competition from other breeds as sport horse mounts; a lack of an overall marketing initiative for off-track Thoroughbreds; a negative perception of racing from the general public; and a lack of quality training for off-the-track horses compared to their expensive sport horse counterparts. But recently there have been changes to unite the aftercare industry and combat the decline. The creation of RRP has helped push OTTB marketing into sport horse areas and more rehoming organizations across the country have popped up to help more horses. The Thoroughbred Aftercare Alliance with its accreditation process has further legitimized the work of these organizations. There's a shifting mindset of Thoroughbred owners and trainers to make aftercare a priority before their horse's final start, and there are passionate online communities of OTTB fans forming digital networks across the world to help horses in need and share best practices. The most important factor? Many hard-working horse lovers who refuse to give up. This new column will shine a light on creative solutions to marketing the ex-racehorse, share the inspiring stories from those who have played a part in finding a forever home for an off-track Thoroughbred, cover tales of athleticism from Thoroughbreds competing at top levels outside the oval, and give a platform to the solutions that are pushing the aftercare industry forward.